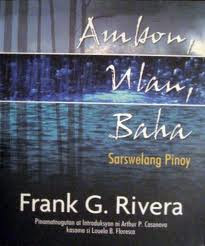 Artists Resource Network Association, Inc. (ARNAI) will once again stage the long time running musicale “AMBON ULAN BAHA” on October 13, 2012 at the San Pablo Central School, San Pablo City, Laguna. It is a two-hour ethno-rock modern zarzuela that showcases twenty original musical scores inspired by kundiman, balitaw, ethnic and modern musical trends with choreography based on ethnic, folk/traditional and creative dances. Artists Resource Network Association, Inc. (ARNAI)’s “ Ambon, Ulan, Baha” has been sponsored by several organizations and institutions and has seen more than 500 performances.